Welcome to our monthly Conscious Cinema at Yogaharta! Every month we will be screening an inspiring, thought-provoking or educational film as a way of bringing our community together and encouraging discussion on important topics! 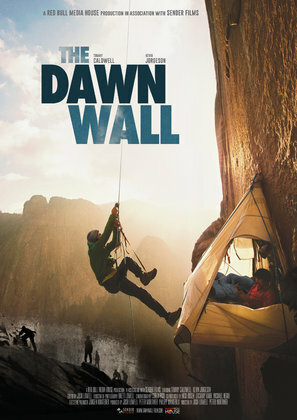 April’s screening will be ‘The Dawn Wall’. But for Tommy Caldwell, The Dawn Wall was much more than just a climb; it was the culmination of a lifetime defined by overcoming obstacles. At the age of 22, the climbing prodigy was taken hostage by rebels in Kyrgyzstan. Shortly after, he lost his index finger in an accident, but resolved to come back stronger. When his marriage fell apart, he escaped the pain by fixating on the extraordinary goal of free climbing The Dawn Wall. Hot drinks and snacks will be available for donation. Bookings: It is a free event, but we would love to know how many people are coming so that we have enough food and drinks, so please book in below! BOOK NOW - IT'S FREE! Join Johannes Egberts, certified instructor, and his team in a full-day immersive experience where you will learn how to unlock your potential through the Wim Hof Method (WHM) – a proven natural way to control stress effectively, boost your metabolism, feel more energised, boost your alkalinity to fight inflammation and infection, help combat depression and anxiety, and improve physical and mental performance. • WHM Theory: Three pillars of the method (1) Breathing Technique, (2) Cold Exposure and (3) Commitment. This will also include a discussion on immune system, inflammation, the science of stress, and brown fat activation – includes an overview of the science and various scientific research. • WHM Practice: Dive deep into the experience as we apply the theory into a guided breath work session, mindset training and cold exposure through ice baths. • Other modalities and exercises throughout the day: Power of music through sound healing and the drumming circle, group work, movement and stretching. Kirtan is the practice of singing or chanting ancient Sanskrit mantras, usually in call and response form. It is not a performance, but rather a union or merging of individuals into an energetic whole. It can be high energy, or slow and meditative. Through our voices, intention and energy we move out of the head and into the heart space, cultivating love, awareness and presence. No experience necessary! Come for the whole time, or just drop in. *Proceeds donated to Yogahood Australia. 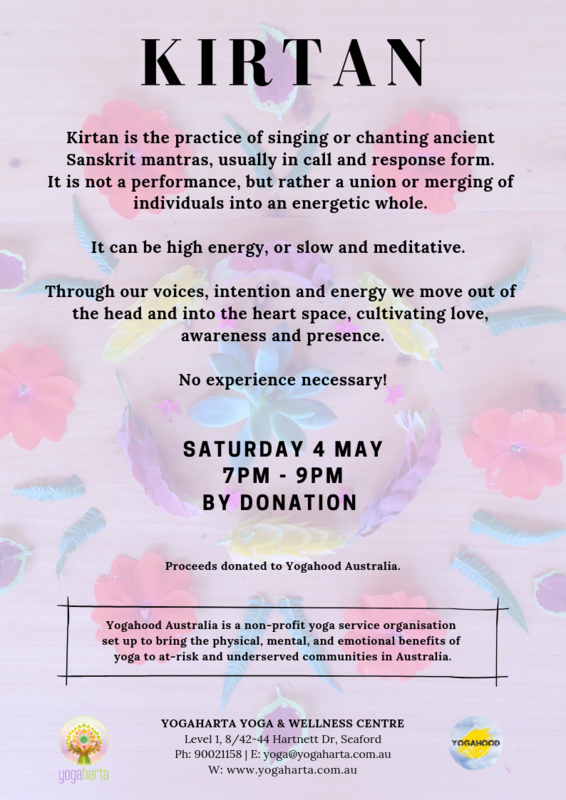 Yogahood Australia is a non-profit yoga service organisation set up to bring the physical, mental, and emotional benefits of yoga to at-risk and underserved communities in Australia. They provide free 6-week programs to organisations involved with these at-risk men, women and youth. Reconnecting with the voice through song is not only one of the best medicines for the soul, it actually cultivates awareness, invigorates the body, regulates our nervous system, opens the heart and mind, and has the capacity to heal through opening up doorways to expression and creativity. Through singing together we remember the purely vibrational relationship we have to one another, free to explore our vulnerabilities in a way that is supported and encouraged. Songs will be selected from a number of traditions, in both English and other languages. 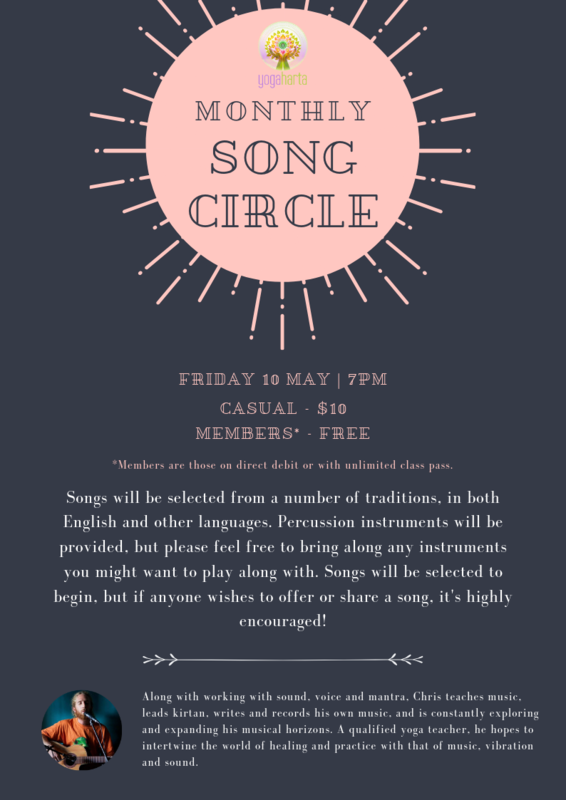 Percussion instruments will be provided, but please feel free to bring along any instruments you might want to play along with. Songs will be selected to begin, but if anyone wishes to offer/share a song, it’s highly encouraged! Bookings: Please book in on MINDBODY, in studio or follow the link below if you plan on coming! Dance in your your own inner bliss. • Rejuvenation – a lying down guided meditation to rest, relax, and integrate the journey. Join Gabrielle for this playful, connective, and deeply restorative practice, which brings together yoga, community, and bodywork (massage). Learn the art of touch through partner stretching and giving/receiving ZenThai Shiatsu. We will work in groups and pairs to find depth and ease in our asana (postures) and then move into learning and sharing floor based bodywork sequences that you can take home to share with your loved ones. Bring open minds and hearts. Gabrielle has 10 years experience as a massage therapist, is a 500 hour trained Yoga instructor, and a certified ZenThai facilitator. She is passionate about connection, presence, and play, believing that touch has the power to communicate a thousand words. Join us as we come together in community for a deep dive through sensation and vibration into the heart of yoga. This 2 hour immersion will combine a fully guided Yin Yoga practice and an immersive Sound Healing experience to calm, purify, and inspire the whole system in tune with the energy of the season. During Autumn we have the opportunity cultivate adaptability through release, gratitude through self-reflection, and balance through spiritual practice. 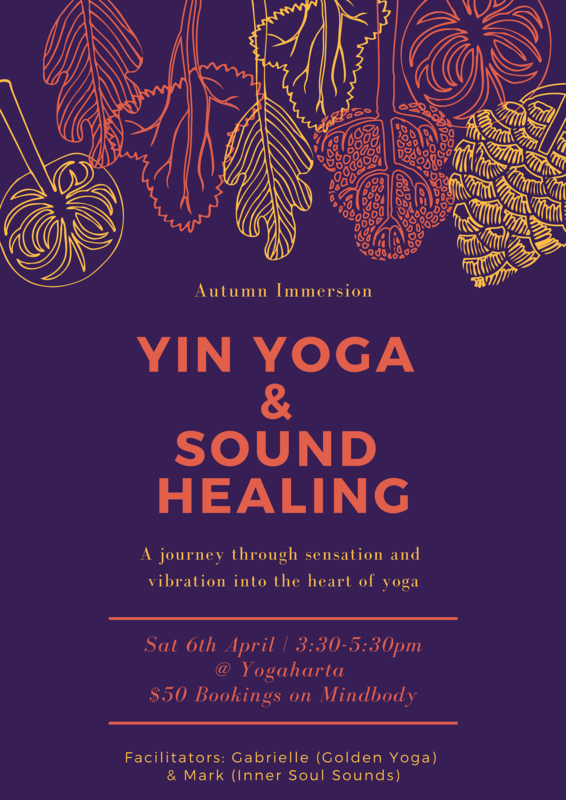 So it is a perfect time to begin to draw inward, nourishing the self with the deeply meditative and connective benefits of Yin Yoga and Sound. Inner Soul Sounds grew up surrounded by the power of music. His intuitive self exploration and study into tribal sounds created an expression for his own personal healing journey, inspiring him to share these gifts with as many people as possible. 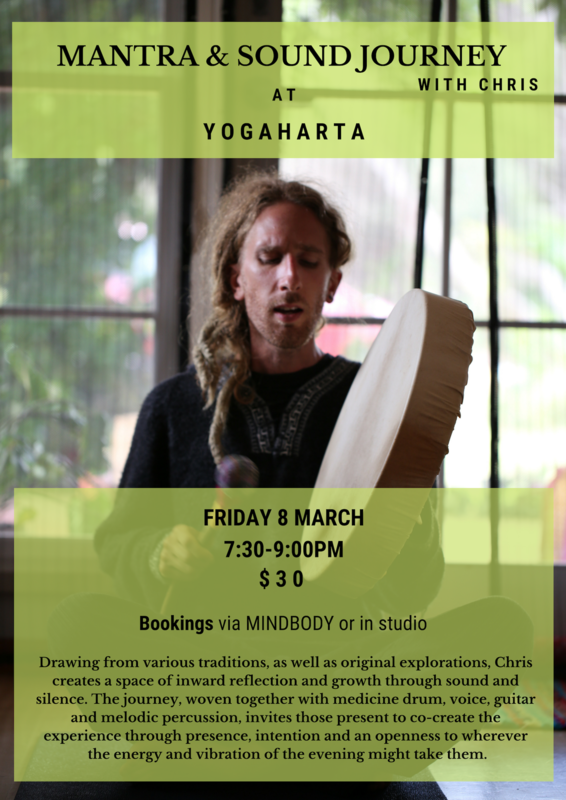 His music repertoire extends from the Handpan, to percussion, crystal bowls and even the didgeridoo – being drawn to all instruments that connect the listener to the vibration that exists behind all things. 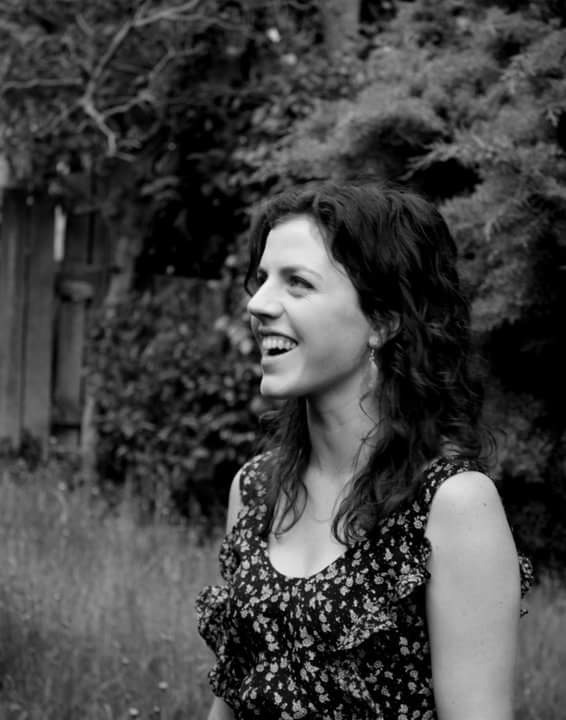 Gabrielle is a passionate and dedicated Yin Yoga instructor who brings with her a wealth of knowledge gained through over a decade of experience in dance, anatomy, and massage therapy. She believes that the body is the vehicle for transformation and as such, is strongly aligned with the power of Yin yoga to illuminate deep insight, develop a keen sense of self awareness, and bring the whole human system into a state of homeostasis. Join her for structured Yin sessions that create the freedom to explore the fullness of your personal experience. Drawing from various traditions, as well as original explorations, Chris creates a space of inward reflection and growth through sound and silence. 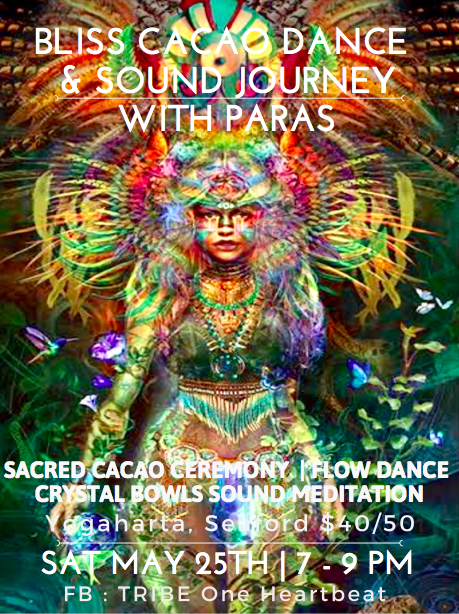 The journey, woven together with medicine drum, voice, guitar and melodic percussion, invites those present to co-create the experience through presence, intention and an openness to wherever the energy and vibration of the evening might take them. Along with working with sound, voice and mantra, Chris teaches music, leads kirtan, writes and records his own music, and is constantly exploring and expanding his musical horizons. Being a qualified yoga teacher, he hopes to intertwine the world of healing and practice with that of music, vibration and sound. 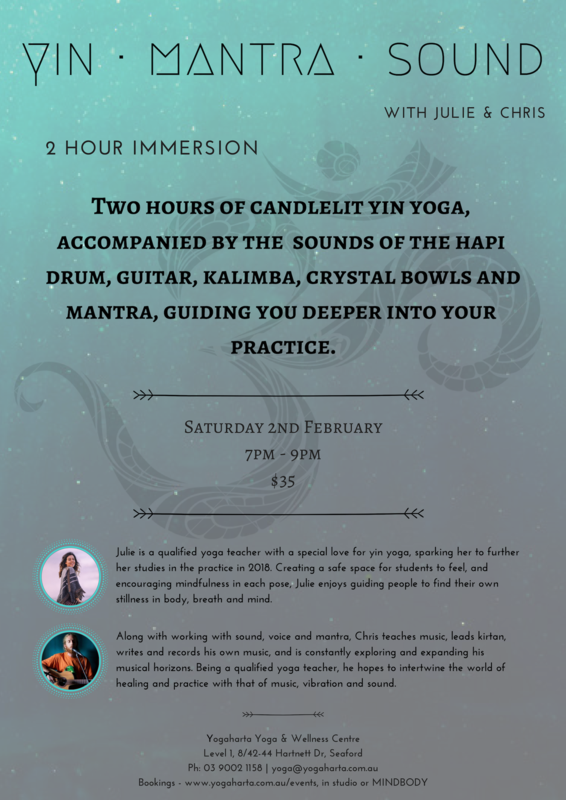 Two hours of candlelit yin yoga, accompanied by the sounds of the HAPI drum, guitar, kalimba, crystal bowls and mantra, guiding you deeper into your practice. Bookings essential, limited places available. Julie Beaumont is a qualified yoga teacher with a special love for yin yoga, sparking her to further her studies in the practice in 2018. Creating a safe space for students to feel, and encouraging mindfulness in each pose, Julie enjoys guiding people to find their own stillness in body, breath and mind. Along with working with sound, voice and mantra, Chris Emmerson teaches music, leads kirtan, writes and records his own music, and is constantly exploring and expanding his musical horizons. Being a qualified yoga teacher, he hopes to intertwine the world of healing and practice with that of music, vibration and sound. A candle-lit journey into the heart, creating deep stillness, peace and relaxation to the sounds of the sacred harp as played in the time of King David. 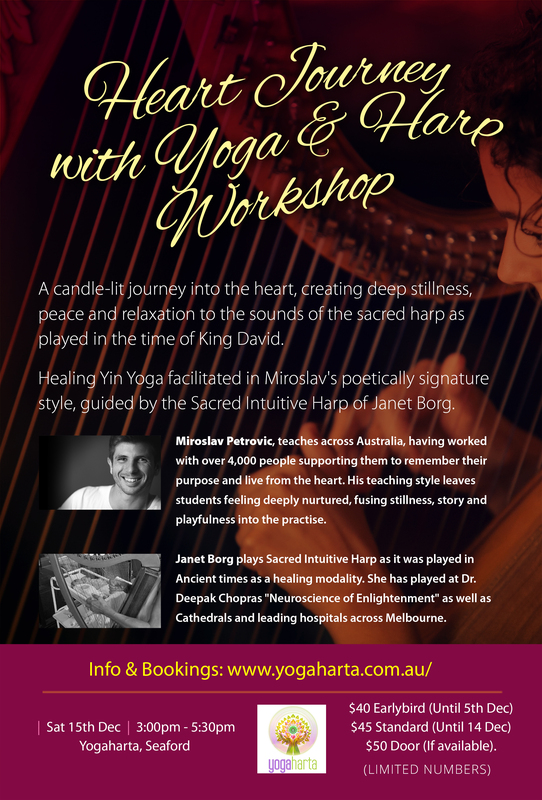 Healing yin yoga facilitated in Miroslav’s poetically signature style, guided by the Sacred Intuitive Harp of Janet Borg. Miroslav Petrovic teaches across Australia, having worked with over 4,000 people supporting them to remember their purpose and live from the heart. His teaching style leaves students feeling deeply nurtured, fusing stillness, story and playfulness into the practise. Janet Borg plays Sacred Intuitive Harp as it was played in Ancient times as a healing modality. She has played at Dr. Deepak Chopra’s “Neuroscience of Enlightenment” as well as Cathedrals and leading hospitals across Melbourne. Love is the most healing power in the universe. Taking time to give ourselves the love and nourishment we need can be surprisingly challenging. 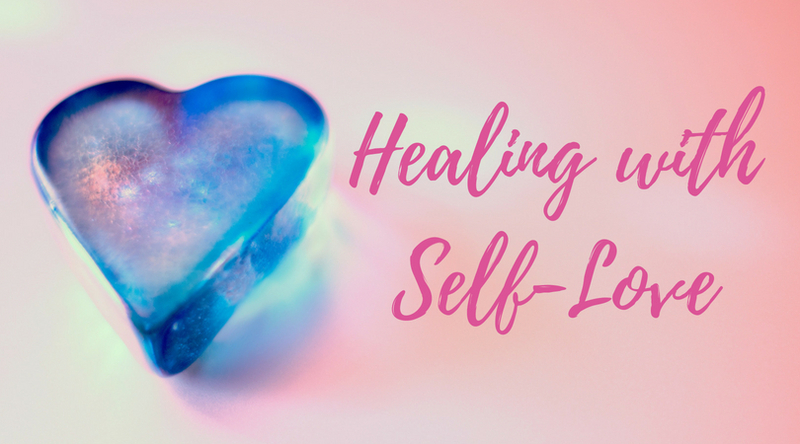 Join Cara from Shining Wellness Ayurveda and Yoga for this workshop on self-love. Bask in the healing energy of love and learn a variety of simple self-love practices you can do at home. The more we cultivate love within ourselves, the more it expands outward to the world around us. Places are limited to 15 and bookings are essential. Discover and tap into the power within to heal yourself and become your true, empowered self. A workshop inspired to leave you more aware, connected, trusting, empowered and with more tools in which you can live your best life! With a focus on kinesiology, energy work, emotional healing, and the subconscious mind, this interactive workshop will involve many practical exercises – with hands-on support. 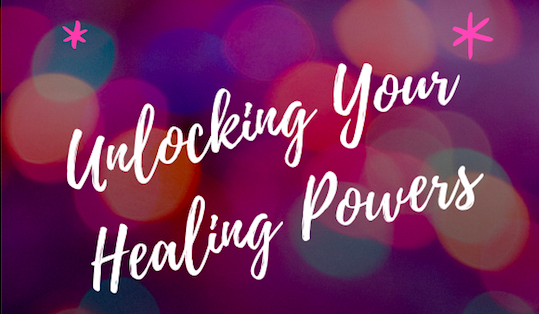 Inspired by a desire to empower her clients, Rachel has designed this workshop to leave you with skills, tools & an awareness to carry out a self-healing practice. 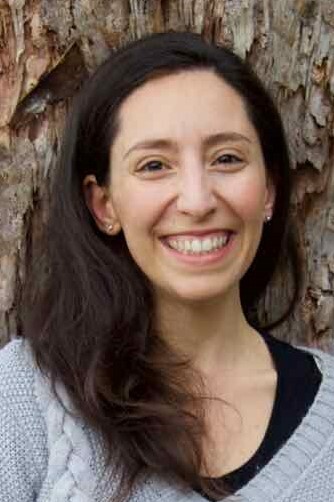 Dr Rachel is a chiropractor passionate about helping you tap into your healing power & true authentic self. Currently serving the community at Evolve in South Frankston, she has worked with clients over the past 7 years throughout Australia & NZ. Places are limited to 12 and bookings are essential. Join Kirsty Saunders for a special class to support you to find deep relaxation and healing. 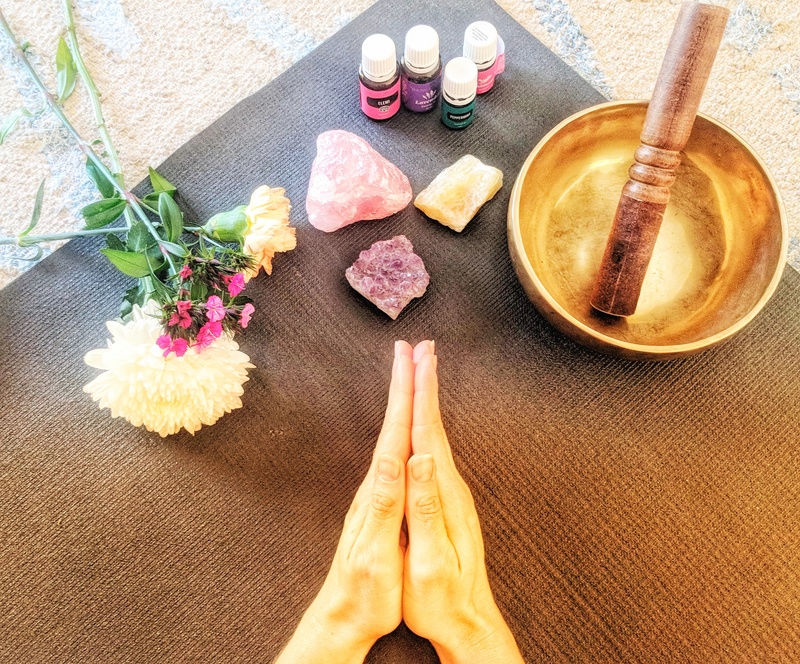 This is the perfect class if you’re looking for some ‘me time’ and want to relax and restore your mind, body and spirit – they will thank you for it! Kirsty is passionate about holding space for people to connect to themselves, to their heart, and to allow for healing. She is a 500 hour (Advanced Diploma) qualified yoga teacher, living in Seaford and loves connecting to the local community through yoga. Kirsty’s yoga classes focus on movement, breath, and mindfulness. She also teaches regular workshops, meditation classes and supports these practices with essential oils. She believes yoga can deepen your understanding of self and optimise wellbeing. Not all essential oils are considered safe during pregnancy or breastfeeding. This has been considered in planning for the class however contact your health care professional if you wish to seek advice on essential oils and pregnancy/breastfeeding. Massage Yoga is a unique and magical practice to help you reach a deeper level of connection, relaxation and release. It is a fully immersive experience with essential oils, music, yoga props, and intelligent sequencing designed to give you deeper awareness of your body and mind, all combined with intuitive touch. Your teacher will guide you through a Yin Yoga practise, while yoga adjustors and massage therapists provide expert hands on adjustment and massage. This creates the perfect setting for deep release and relaxation. The experience is all encompassing. Most people are deeply relaxed, sleepy and feel open and flexible after the session. You are working deep into the soft tissue of the body in this practise, you may be achy the next day, and sometimes it can cause you to feel emotional, nauseous or dizzy during or directly after a session, so it’s a good idea to have time to rest afterwards. Bring a towel and some water, and wear long sleeve top and yoga pants are ideal. If you get cold easily also bring layers and warm socks. It’s best to be well rested and hydrated prior to the session, and to not eat a heavy meal within 2 hours of the session. Our team includes is made up of trained massage therapists, physiotherapists, reiki healers, and myotherapists. There is a 1:4 therapist/student ratio. Sessions run for two hours, and bookings are essential. Bookings will close 4 days prior to the workshop to ensure the correct student to Massage Therapist/Adjustor ratio. Bliss out and take relaxation to new heights with hands-on Yin Yoga. *As we are running two sessions, if the sessions are half filled we retain the right to merge the sessions.